Archives International, in partnership with iCollector.com, have put their June sale with a fantastic array of banknotes up for auction to the highest bidder. On Tuesday June 28th, 2016, over 1000 Lots will be selling throughout the day. The sale will be offered in 2 sessions with Chinese & Asian Banknotes and Chinese Scripophily (Lots 1 to 415) to begin at 10:30 AM and Worldwide Banknotes (Lots 416 to 1049) to be offered no earlier than 2:30 PM. 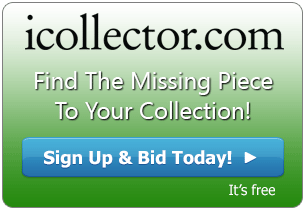 Absentee bidding can be made anytime up until auction day, and live bidding will be accepted on auction day. Highlighting the opening of the day is Lot 18. This is a Bank of China 1912 “Mukden – Manchuria” Branch Issue and is a rarity. 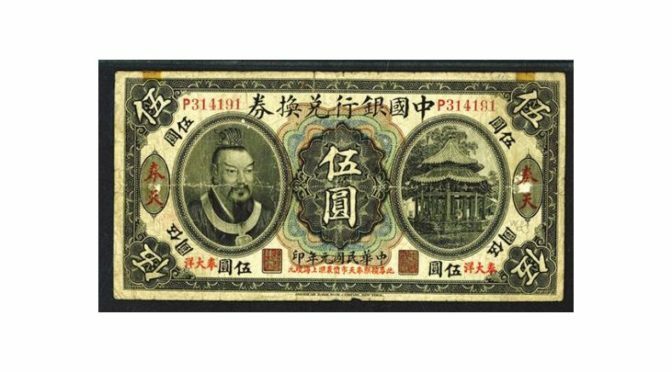 The full description reads: “China, $5, P-26m S/M#C294-31m, Issued banknote, Black with Portrait of Emperor Huang-ti at left gazebo at right, back brown with red 6 Chinese Character overprint under curved title at top and overprinted in English in red MUKDEN and in the lower margin MANCHURIA. Serial# P314191, PMG graded Choice Fine 15 NET, Attractive note with tape remnants on the top margin, the small ovals on the right and left front have ink abraded, but otherwise and extremely rare and very presentable banknote. This is the only example ever graded in the PMG census. ABNC.” This fantastic note has an opening bid of $1500. Lot 198 is another highlight of Chinese banknotes. Presented here is an American-Oriental Banking Corporation 1919 “Shanghai Branch” Issue Specimen. Fully described as “Shanghai, China, 1919, $100, P-S100s (S/M #S53-0.5), Specimen banknote, Dark brown on emerald green and m/c underprint with bank logo of steamship in circle on face, back brown with freighter, tug with barge and sail boat, PMG graded “65 Gem Uncirculated – EPQ (Exceptional Paper Quality)”. Extremely rare note that was not even known to exist before the 1991 Christies Auction of the ABN archives. A high grade trophy note worth of the finest collection. ABNC.” This note is estimated in value as high as $7000 and opens for bidding at $3000. Robert Swartz and the staff at Archives International and world leading experts in this field. Bidders are encouraged to contact them via email or telephone to get to know the material and ask any questions. All lots are online with photos and full descriptions. Bidding opens on Tuesday June 28th at 10:30AM Eastern Time and runs for the entire day.